40Tech is pleased to present a guest post by Michael Carper. When I began college, I was determined to keep track of all my homework, papers, tests, and scheduled activities. A staple of college scheduling is the syllabus, which lays out the due dates and assigned readings and homework for each class. However, syllabuses are just pieces of paper. I realized that it would be a huge pain to look up daily, from four or five different sources, what the assignments were for that day. I wanted to look at a single source and grasp all the work I had to do for that day, and for that week. More importantly, I wanted to keep in mind upcoming tests and papers several weeks ahead of time, in order to prepare time to work on them. With this predilection for planning, I looked to my built-in OS calendar, iCal. There were many advantages to using it. I didn’t have to boot up Chrome or worry about web browsing. I could organize by color, assigning one to events, one to assignments, and another to work. I actually put my entire class schedule, as well as ordinary things like “lunch,” into iCal. I put not only due dates, but little reminders when certain benchmarks should be met in prep for those due dates. It was my lifeline. However, little problems grew to be big annoyances. The most striking was the way iCal handled longer titles. I copied entire reading assignments into iCal. For some single class periods, this could include multiple texts or several page selections. Shorter entries would be completely displayed in the month-long calendar view, which I always used. I didn’t need to see my days broken down in the traditional week-long format, but I did want to see the tests and papers on the horizons. However, in this view, longer entries were simply abridged. There was no indication that an entry was actually much longer than it appeared, since they always stuck to a single line. On several instances, this lack of informative UI actually led to ignored homework assignments, since the entry was actually much longer than appeared and contained more readings than it appeared to. Ironically, in those instances, my calendar made me less prepared. There were other little things, as well. Entry of events was very manual; you had to put all details in only their specific field. Once made, you could not edit an event after clicking on it, but instead had to go to its “edit” page. The tethering of iCal to my Mac turned out to be a disadvantage, since I often ended up with hours to spare, homework to do, and no personal computer at my fingertips. I couldn’t sync it in any way with my iPod Touch, either. 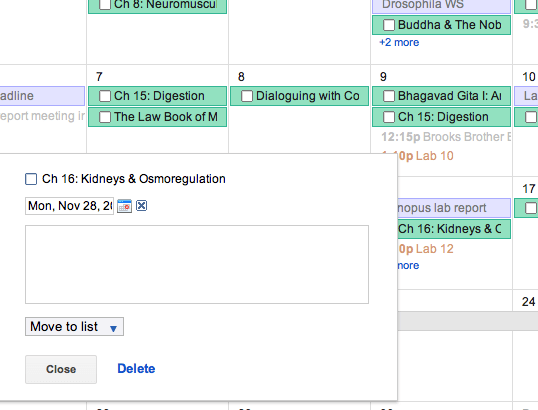 So beginning of my junior, I finally took a look at Google Calendar. Since I had been a loyal Gmail user for many years, it only seemed natural. Immediately I noticed where GCal improved over iCal. The most prominent was the ease of creating events. I no longer had to cycle through different boxes to mark the date and time. Instead, I could simply jot down, “meeting 12-1” as an entry name for a certain day, and there it appeared, from the 12:00 PM to 1:00 PM slot. And if I felt like changing it, I could edit the entry title from the pop-up that appeared when I clicked it the first time, unlike iCal. It wasn’t just the cleaner, more pleasing UI that won me over. Accessing my calendar outside my room was as simple as accessing my email–just log in to Google. I could access it on my iPod as well, albeit not with an official Google app. School events were always announced via email. I could either copy and paste the location and time details from one tab to another, or I could even click “More” in Gmail and create an event based on the email. 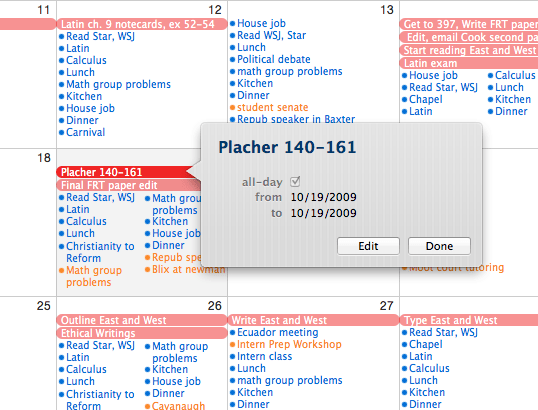 If viewing an online calendar, such as the one published by my college, I could even import all the events into mine. Six months later, I still haven’t taken advantage of everything Google Calendar has to offer, like sharing my calendar with others or inviting them to scheduled meetings. Those two functionalities are so amazingly useful, it’s a pity I’ve only encountered them at places I’ve interned. The rest of my fellow students, unfortunately, are still stuck in the Stone Age, with their paper syllabuses and calendar. Some of them may have progressed to iCal, marking their progress into the Bronze Age. They, and everyone else, should wise up and join those of us with our Google Calendars in the Golden Age. I will add that I’ve tried the Fantastical Calendar app. Fantastical syncs with iCal or Outlook, but not Google Calendar, so I had to export from Google Calendar to iCal and then sync Fantastical with iCal. It’s UI is very nice. The recognition of event details is more intuitive than Google Calendar’s, expanding its recognition to location details and invitees whose address you have in your Contacts as well. You can read more about it in Evan’s review. My judgment is that although it has the best user interface, the ability of Google Calendar to sync with other Google apps, especially through email, is invaluable. Since I always have a web browser opened anyway, leaving a tab for Google Calendar is hardly cumbersome. $20 is a lot for calendar software, but, in my opinion, is something that would be used everyday. So if I spent less time on Google, Fantastical would be my go-to calendar. Michael is a student at Wabash College and writer for the Reading Glasses Shopper blog. He realizes that actually the Iron Age, not the Golden Age, followed the Bronze Age.